With a little re-editing you could probably market Christy Garland’s Cheer Up as a cinéma vérité sports drama instead of as a documentary. It has all the trappings of a fiction film, it just happens to star non-fictional people doing non-fictional things. The Arctic Circle Spirit is the worst cheerleading squad in Finland, coming in a humiliating last place at the annual Finnish National Cheerleading Qualifiers in Oulu. Determined to turn the team around, their head coach Miia travels to Dallas, Texas—the Mecca of cheerleading—to get tips from American experts. Armed with a fresh can-do attitude and all the wrong lessons, she proceeds to bully her team, spouting platitudes about being a family all while doing virtually nothing to help them actually become better cheerleaders. If they create new routines or try new moves, then the film doesn’t show them. We just see a lot of “tough love” and footage of young women cracking their noses against the floor. Unsurprisingly, at the next round of Qualifiers, they come in second to last. It’d be funny if the film didn’t take it all so damn seriously. But there’s not an ounce of levity anywhere in Cheer Up. The plot summary I mentioned above takes up maybe 15 minutes of screen-time. 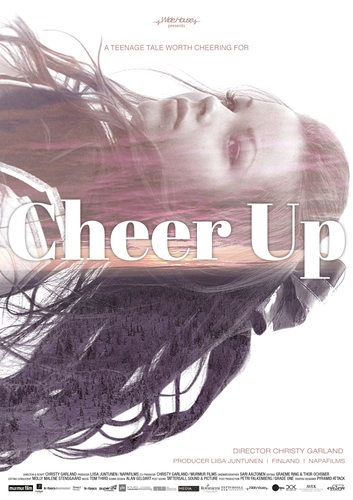 The rest of the film explores the dour, gloomy lives of Miia and her cheerleaders. It quickly becomes apparent that maybe the reason why the cheerleaders are terrible isn’t that they’re unskilled, but because they’re all crippled with depressing home lives. One girl can’t escape her grief over her mom’s death and can’t handle how her father has gotten another woman pregnant. Another languishes in a dead-end life with a dead-end boyfriend in a dead-end band. There’s even one weird subplot about Miia finally finding love on tindr, hooking up, getting dumped, and discovering she’s pregnant like it’s the prologue of a cheap Victorian novel about miserable people falling in love on the Scottish moors. But I get it: if the film’s ironic title wasn’t a dead giveaway, Cheer Up isn’t so much about cheerleading as it is a group of cheerleaders trying to find meaning and purpose in their sad little lives. Then why does the film set itself up in the first third as being an inspirational sports flick? It’s shot, paced, and edited with all the fluidity and focus of a fiction film. But afterwards it finds prolonged shots of the cheerleaders walking through the snowy Finnish countryside with their cats more interesting than the cheerleading. I’ll bet there’s more scenes of the cheerleaders smoking in silence than of them actually practicing. The film can’t even keep itself formally consistent. Nowhere is this more apparent than during the film’s SINGLE talking head interview. It’s not at the beginning or end either, it’s somewhere in the middle. The overall effect is a film that’s unfocused, unclear, directionless. The film barely cracks 80 minutes, but it feels over two hours long. CHEER UP plays at DOC NYC later today. For tickets and more information go here.